Link for Aid has brought aid directly to those most in need in Myanmar and in Cambodia – disadvantaged children and old people - using the funds raised through friends, through mailings and by organizing fund-raising events. Each time she returns to Yangon Pamela visits local markets and buys basic necessities such as rice, lentils, oil, vegetables, copybooks and pens, delivering them directly to the Mary Chapman School for the Deaf together with donations to help the daily running of the institute. She does the same for the hospice helping the sisters to purchase food for the 220 old people in their care. 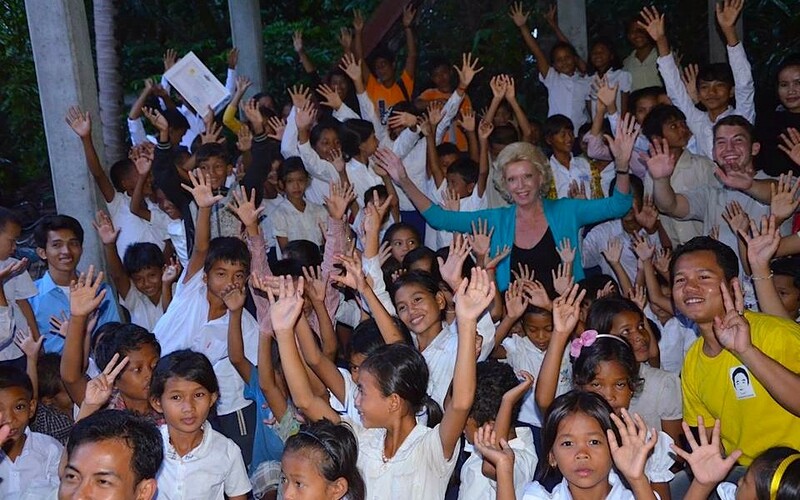 In Cambodia we help the Angkor Kids Centre, near Angkor Wat, donating uniforms and bicycles that have allowed dozens of children in Samrong village to attend school, and donating a solar panel to the village school. And, since the end of last year we have been helping to support a little orphanage in Dala, across the Yangon river, where 23 children, aged 3 to 18 are looked after by a couple who have dedicated their lives to giving these orphans a home and a family. The Mary Chapman School for the Deaf, in Dagon Township in Yangon, was founded by an English lady in 1920. It is a private institute and does not benefit from any state aid, depending entirely on donations and humanitarian aid. As well as teaching deaf and dumb children, aged from 5 to eighteen, it is a vocational training centre for teachers for the deaf. Currently the school has some 300 pupils from 12 different ethnic groups and of 4 religions (Buddhist, Christian, Muslim and Hindu) some thirty of whom are full-time boarders. There are also ten young trainee teacherswho help the children learn crafts such as sewing, dressmaking, knitting, embroidery, how to use the PC, book-binding, cooking and Shiatsu massage. In the heart of Yangon looks after some 250 old people. In May 2008 when Cyclone Nargis ripped through the Delta area, wiping out villages and killing thousands, the hospice took in many old people who had been left destitute and without a roof over their head. The building is old, but the sisters do all they can to provide dignified and comfortableliving conditions for the old folk with the donations they receive. The hospice survives entirely on money received from donors. Link for Aid buys staple foods in local wholesale markets and brings them to the Home, it also leaves donations for the daily running costs, including food and kindling……the sisters cook over 800 meals a day on a 100-year old wood-buring stove! Since 2011 we have been helping the Angkor Kids Centre in Samrong village which is 30 kilometres from the famousAngkor Wat temple complex, a centre for English learning where some 380 children attend English classes after school. In 2012 we provided school uniforms and bicycles for 25 children whose families could not afford to send them to school and we gave scholarships to the volunteer teachers to allow them to attend technical colleges and university. We also donated a solar panel for the school building which was inaugurated last year, gave a microloan to a young girl in the village to allow her to set up her own business. And we founded and funded the Angkor Kids Library, for which a new room was added to the school building. Dala is a rural area of small villages across the Yangon river from the ex-capital which counts some 6 million inhabitants. Parami is a small community of 18 orphans who are looked after by a husband and wife who provide for their wellbeing by renting and cultivating rice fields, and send them to local state schools. Link for Aid is raising funds to help provide for the running costs of the little orphanage – food, clothing, etc. It is also setting up English classes for the children who are aged from 3 to 18. A photographic book on Yangon. A book with a difference, the brainchaild of two curious and discerning travellers: Pamela McCourt Francescone who will write the words and Francesca Moscheni, the well-known Italian lifestyle and travel photographer. The book will be a portrait of the city, which is the mirror of the soul of Myanmar and of its people, with photographs taken by 8 deaf and dumb children from the Mary Chapman School – most of whom have never held camera before. Through their heightened sensitivity to all things visual, they will reveal the poetic, extraordinary and unknown sides of Asia’s most charismatic and fascinating city.